As Peter Drucker wisely noted, "Developing talent is business's most important task." But the truth about leadership development would imply the opposite is happening: 63-65% of companies identify leadership development as their #1 current and future human capital concern, yet only 19% of organizations rate themselves as effective at developing leaders. If you are looking to bring all these pieces together for your next offsite or retreat, contact Ascent at steve@ascent.net or visit www.ascent.net/programs to explore what transformative, tailored experiences we can deliver uniquely for you. 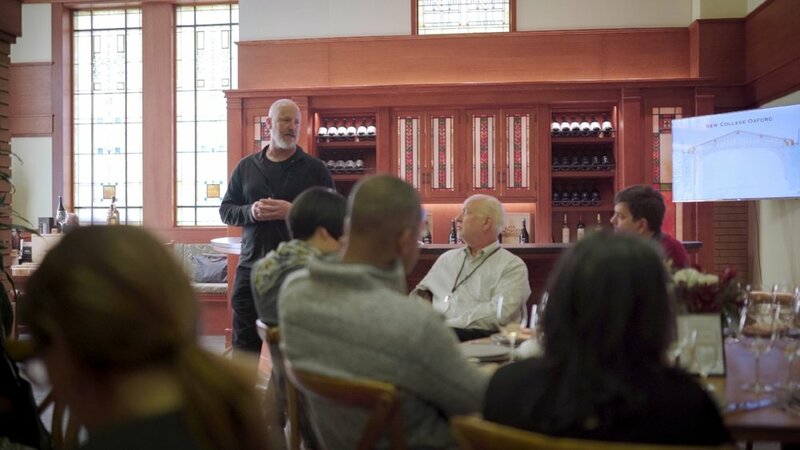 To cap this fantastic week of learning with our leaders from the Fellowship for Family-run and Founder-led Businesses, we invited Alexander Rose, Executive Director of the Long Now Foundation to speak. The Long Now Foundation fosters long-term thinking - specifically in 10,000-year horizons. His inspiring talk begs the question, what changes do you need to make in your organization to ensure its longevity? This definitely gives us some food for thought as we ponder what the future of organizations, and the world as a whole, could look like in 10,000 years. Ascent’s CEO, Kevin Steinberg, introduces the short film about to be viewed by the faculty, Fellows, and esteemed guests in the David Lean Theater at Summit Skywalker Ranch in Marin County, California. Frederic Vieil, President & CEO of Hexagone, is passionate about expanding happiness and healthy eating through the creation of French food halls, starting in Boston. Nell Diamond, Founder & CEO of Hill House Home, is redefining shopping for the new generation of 21st-century women by helping them communicate their values through their purchases. Stephen Bronfman, Executive Chairman of Claridge, Inc., wants to see the adoption of the "happiness index," starting with a simple smile campaign to become a national movement in his native Canada. Gowri Ishwaran, CEO of the Global Education & Leadership Foundation in India, sees how with the huge societal changes caused by new technologies requires us to help young people navigate this new world through new curricula to educate them on necessary ethics and altruism to make right choices. Ascent is growing a network of like-minded people committed to helping leaders thrive, and we look forward to continue casting individuals for the next scenes of this evolving story. Ascent Leadership Networks’ panel, led by Ascent CEO Kevin Steinberg (far right) at Techonomy 2018, left to right: Topher White (CEO, the Rainforest Connection), Sung Park (President, Archimedes), Dr. Amit Mukherjee (Founder, Ishan Advisors), Lowinn Kibbey (Global Head, Johnson & Johnson Human Performance Institute), and Gina Hadley (Co-Founder, The Second Shift) discusses using technology to positively affect leadership. Leaders must constantly navigate the ever-changing state of the world while keeping up with the seemingly daily transformations in technology. Sung Park suggested, "Schedule time to think: the quality of ideas is more important than the quantity of work you do." As Lowinn Kibbey questioned, "Technology is changing and illuminating human behavior, but can it improve it?" I’ve trained or coached around 2,000 leaders in the course of my career. But I’ve never seen anything quite like this. Too many executive education efforts provide only a pleasant experience, a certificate on the wall, and being hit up for money by the institution that provided the program. What makes a difference back at the office is a genuine change of behavior, and watching an expert doesn’t make that happen. Perhaps the first person to map this out based on real research into successful entrepreneurs was John Atkinson; given that his research goes all the way back to the 1950s, it certainly isn’t new (though I wonder why some of the apparently obvious things above keep going missing from development plans!). A few other things are less well known, but make a difference: public declaration of a goal, a mentor or mentoring network (cf. Kram), and the like. When we incorporated Strategic Development planning into the Ascent Fellowship program, we paid attention to all these things, of course. We set aside time for people to develop a goal statement, had them work in small groups to hot-test their ambitious goals and make sure they weren’t too ambitious, then gave time and a framework to lay out their action steps, milestones, and so forth. Then we got unintentionally smart. once leaders reach a certain level, they don’t have time for anything other than a personalized program. Ascent takes a new approach to leadership development, creating a curated cohort to learn from and mentor each other as much as from any content, senior mentors, or other content providers we might have. We also have other special aspects: extraordinary settings to emphasize the learning, an executive-level assessment to help tailor their learning, and diversity in content and people, but the key to it all is the cohort itself. We emphasized that when developing their plan, they should work in anyone in the room who could help them: our senior mentors, the Ascent team and assessors, but most of all each other. We told them to anchor people into their goals: as advisors before a critical meeting, or to involve in a particular initiative, or just to call them to ask how their goal is going, and to be sure to book that call or meeting. And this is where we moved from the logical and useful to the extraordinary and powerful. We had been afraid that a sit-down process, however necessary, might diminish the energy generated over the week they had been together. We were wrong on two counts: if anything, they gained energy – and they certainly weren’t just sitting down! They were moving around, asking each other for help, alliances, information, guidance – and getting progressively more excited as the aspirational moved towards the practical. One small subgroup came together to support a key diversity initiative – but not as a clique, for all of them signed on to other people’s plans as well. One CEO of a startup wandered around, unsure of what to do. I asked about his plan; he said his first step was raising funds. I turned to another CEO in the group, a seasoned startup leader of multiple firms and said, “would you like to help?” “Sure!” he said, and they got to work. Several set up times to introduce each other to their larger network. 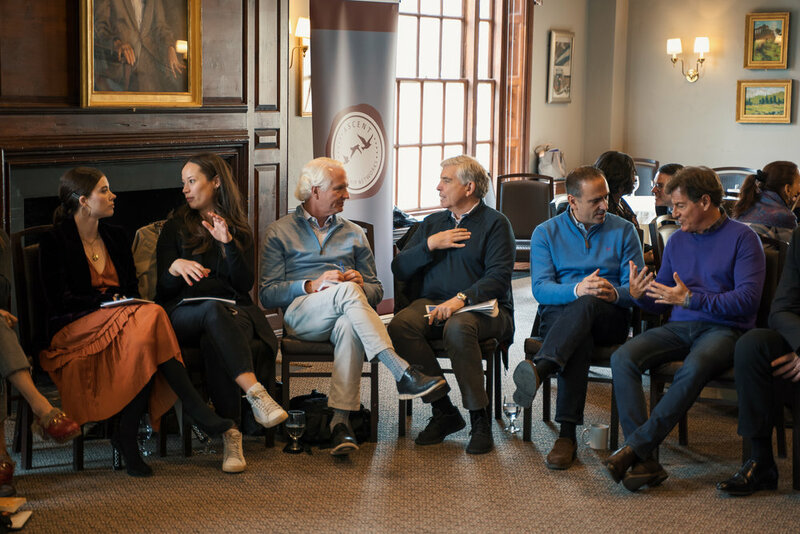 Among our cohort and mentors are some genuine luminaries – CEOs, diplomats, even a president – who opened up their experiences and their connections to help others make this happen. It appears a number of new ventures were brainstormed just because of this session! We asked people for their feedback on the whole module, of course, and while they liked and found many things very useful, strategic development planning got the top ratings for usefulness (one bypassed the five-point scale entirely, scribbling in “10, 10, 10!”), and several wanted more time, to work plans out still further. Fortunately, this isn’t a one-time event. Our Fellowship continues over time – two more modules for this cohort, each spaced a few months apart to allow them to take action on their learning – plus any follow-up we do in the future. Next time, we’ll start off by seeing how they are going on their plans, and rest assured we will keep time for more planning. But what made it work wasn’t us – oh, it was helpful to know how development works and to provide guidance on development planning, and whatnot, but at the end of the day, the group itself was the power source. The group was both diverse and had overlapping issues; and they had opened up to each other to offer help and to ask for it, and you could see the energy they generated as a consequence – the critical mass that led to an explosion of creativity for future impact. Welcome to Ascent in the News! Here you’ll find recent articles about leadership development and personal growth. We love sharing our experiences and what we’ve learned along the way. Follow us on LinkedIn for real-time updates. NEW YORK, November 2018 – Ascent Leadership Networks, an executive development company specializing in immersive experiences and cohort-based learning, hosted its inaugural immersion program in the San Francisco bay area last week from November 13th to 16th. Titled Technological Disruption, Innovation and Narrative, the series was the first within a larger Family-run and Founder-led Businesses Fellowship. A trip to India reveals lessons in leadership.